Some time back I did a Balneum cream review, but at the time I used it my skin was probably in the worst state it has ever been in. As I mentioned then, I think that whatever I put on my eczema at that time would have made it worse - it just needed the chance to calm, but at that point my viewpoint was: 'must find something to put on it to make it better!' My poor face :( It was a right mess! This time when I got the chance to do a 4 week trial of Balneum cream, with accompanying survey run by Talk Eczema, I was definitely willing to give it another try as my skin is now so much better - but by no means perfect. How did the trial work? I was sent a large bottle of Balneum cream (500g), sufficient to last me over the 28 day trial. I liked the pump dispenser, which made the cream easy and hygienic to dispense. I had to select a body part for the trial, and apply the Balneum to that area twice a day. I chose my left arm. The crooks of my arms have always been the most badly affected by eczema, and I thought it would make a good like-for-like test as I could easily compare arms. Balneum cream contains 5% urea, which retains water and increases moisture. It also contains ceramide 3. I have no idea what this is, but apparently it helps restore the barrier function of your skin. The cream is free of fragrances, colourants and preservatives and is meant to relieve dry and very dry skin. The bottle says 'do not use on broken and inflamed skin', which I find strange, as this trial was targeting eczema sufferers specifically, who definitely have broken and inflamed skin! What is Balneum Cream like? 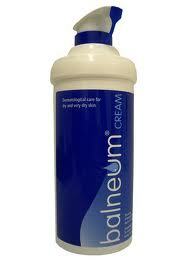 Balneum cream is a thick, white cream. I wasn't too keen on the smell, although it was only very mild, quite hard to describe - sort of biscuity but not in a yummy way. However, better this than added perfume! As the cream is thicker than the lotion I usually use, it was more time-consuming to apply, and took more rubbing in. It stung a little on the eczema patches, but I am yet to find a cream that doesn't do this. It didn't irritate or inflame the eczema further or make me want to itch it though, which some creams can do. I found the cream very nourishing, and over the course of applying it twice a day for a month I did notice my skin get softer and healthier. Balneum cream is a good general emollient. Personally, I prefer something a little lighter that takes less rubbing in and is quicker to apply, especially as I need to do my whole body. I found the Balneum too heavy to use on my face - especially in the summer. At the end of the trial my left arm was no different to my right arm. At some points in the trial my right arm was worse, and at some points, my left. On my right arm I used either Vaseline lotion, Vaseline cream, or Salcura Zeoderm cream - a new product I have been sent, and applied them with the same regularity. I think what helped me most over this trial was the fact that it made me apply my emollient twice a day without fail - instead of just in the morning (and only occasionally before bed as well). It has really hammered home that if I need to get my skin healthy I need to apply more regularly than once a day.